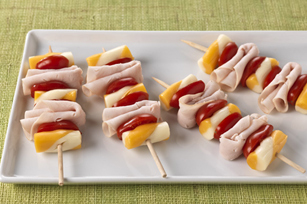 Said one reviewer of our easy, cheesy Twister Turkey Kabobs, 'Can't mess this up! Good snack for anything.' Truer words were never said. Thread ingredients alternately onto 4 skewers. Serve each kabob with 1 Tbsp. KRAFT Lite Ranch Dressing. Grape tomatoes can be a choking hazard. Do not serve to children under 6 years of age. Start a garden with the kids. Even picky eaters are more likely to eat vegetables that they grew themselves.